I was initially just intrigued by these three books. The first movie came out in March, but I definitely wanted to read the books first. 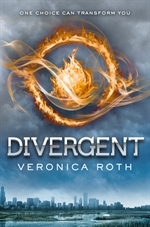 I was excited because the author, Veronica Roth, is literally MY AGE and a big inspiration to me, as a writer. If she can write a trilogy of books, and then some, AND sell the trilogy to a movie studio, then so can I! But I finally started reading in July, when I went to North Carolina for a mission trip with my church. I powered through Divergent on the drive down (Seven hours as a van co-pilot will do that), and bought Insurgent at a Walmart when we arrived. By the time I got back home a week later, I wanted to get through Allegiant as quickly as possible. As of last night, at the end of December, I was only six chapters in. But, today, I have finished!! 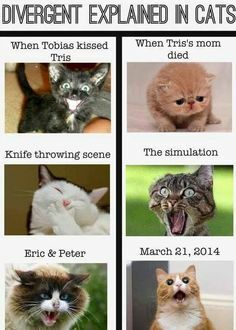 Divergent is building the characters and the story. 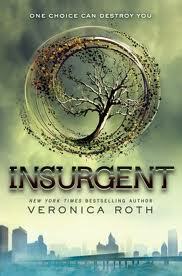 Insurgent is where the action kicks into high gear. 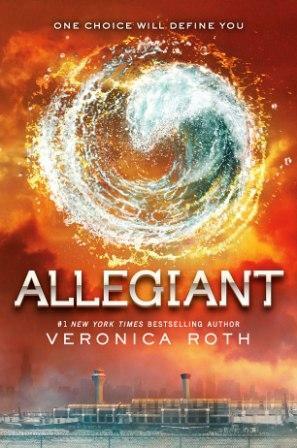 Allegiant is very political and picking up the pieces from the war/massive conflict in Insurgent. I liked Roth’s writing style. I enjoyed learning about the characters. 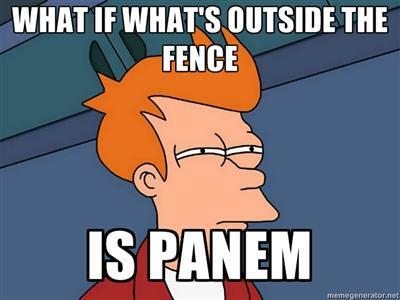 Tris reminds me of me, in a way. Really easy read – I powered through this one in just a few hours. This is where the action was. I liked the plot lines and the development of the characters. I also liked how the story picked up from the last page of Divergent. This one … It was tough. It took me almost five whole months to get through it, mainly due to this thing called life. I was almost immediately turned off by the alternating points of view, back and forth and back and forth. As a writer, I completely understand Roth’s intentions, but as a reader, it just didn’t flow as well as I’d thought. It certainly wasn’t a bad ending, it was just tough to wade through. 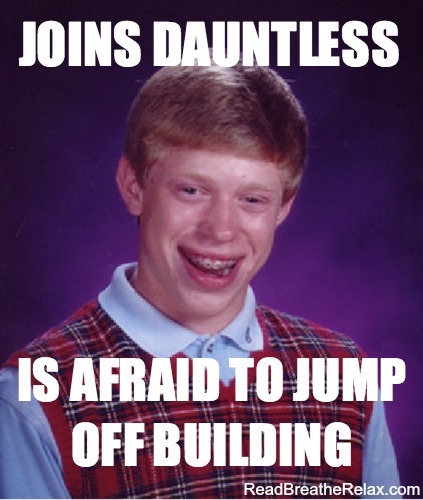 Just for kicks, here are some delightful Divergent memes! This entry was posted in Book Reviews and tagged Commentary, Opinion, Reading. Bookmark the permalink. I see what you mean. Thanks for your comment!